Daytime TV: What's it like to be a guest on the Queen Latifah Show? 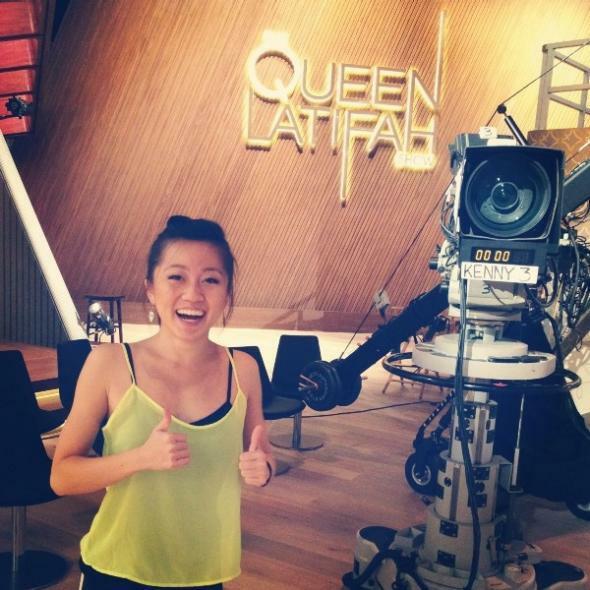 What’s It Like to Be a Guest on the Queen Latifah Show? I never thought I’d be on TV. I’d always wondered — how do they pick guests? Is it scripted? How is taping different than what you see on TV? Recently I got to be a guest on The Queen Latifah Show. A couple things surprised me — here’s what I learned. A few months ago, I made a dance video that went viral (3 million views). Several national TV shows contacted me within a few days —it was a pretty whirlwind, exciting time. The best I understand it, these shows have assistant producers who scout the Internet for interesting stories and viral videos. When they find it, they’ll reach out to you and talk to you on the phone. If you agree to do it, the assistant producer will then pitch the idea to the executive producer. If you get the go-ahead, they’ll slot you in for a time. There’s a lot of back and forth, though. I talked to several shows, and sometimes they’d be totally interested in you one day and then drop you the next. All daytime shows want what they call an exclusive. This doesn’t mean you agree to do only their show—it just means you agree to appear on their show first. But since everyone wants an exclusive, once you appear on one show, you can’t go on others. They asked me to come fully dressed, made up, and ready to go. They’d do the finishing touches. They asked me to bring a couple different options to wear. Nothing all black or all white (I’ve heard it’s hard to light for), and no text or logos (darn, I was hoping to promote my startup!). They had a hair stylist and makeup artist do their magic on me. In person, I didn’t think it looked that great, but when I watched it back on TV, I was surprised. I don’t know what lighting voodoo they did, but I definitely looked better on TV than I did in person! When she’s hosting the show, Queen Latifah reads off a teleprompter. It makes sense —it’s way too much to memorize every day. Still, this surprised me because of how naturally she did it. I could never tell from just watching. They prepared all the questions for me in advance, and the producer practiced with me backstage before I went on. They didn’t ask me to read off of cue cards, though— they let me answer the questions naturally. They tape a few days before they air, so it’s like they’re always living in the future—“Happy Friday!” when it’s actually Tuesday. And after that they taped my segment, which was the first segment to air. It seems like a lot to keep track of. I guess actors have to do this, too. Mad respect to them. The whole experience was a lot less nerve-wracking than I thought. I think because it wasn’t live, that took the pressure off. I knew if something went wrong they could always re-record. And that they did— they re-recorded part of the segment at the end when the camera couldn’t get a clear shot of Queen Latifah because of where I was standing. Overall, I was just really impressed by how they ran everything. They were extremely organized and treated me well. So many things could go wrong— a guest could get sick or miss her flight. They have to fill each day, every day, with interesting content. They work around the clock—I got texts from the assistant producer from early in the morning until late at night. Sometimes, we founders like to think we work the hardest. And it’s true that building a company is a lot of hard work. But every time I’m exposed to a new world, I see that they work just as hard , maybe harder. Dancers, lawyers, musicians, bankers, maids, makeup artists, writers, producers, TV hosts. It doesn’t matter the profession, the top of every field works their butts off. I love seeing how things work behind the scenes, and that’s why we’re making 100. Questions? Ask Karen on Twitter: @karenxcheng. What is the atmosphere like on the set of Scandal? Which is the deepest animated cartoon ever and why? What is the best TV show character ever created?